I love to cook, but sometimes cooking stresses me out. I don’t particularly like to cook during the work week, frequently (lately almost every day) I don’t have much patience to be in the kitchen, all I want is to enjoy these few hours at home before going to sleep. There’s no pattern really, sometimes I get home excited to try out a new recipe, other times I just want to cook something simple to leave the kitchen as soon as possible. The truth is that this week I spent a lot of time in the kitchen and it’s been great. I’m putting all of this in a list! Tomato sauce with tomatoes that were too soft to eat – to can I used these tips (in portuguese), I never canned tomato sauce before, hope it works out. I usually freeze tomato sauce but canning would save a lot of space in my small freezer. 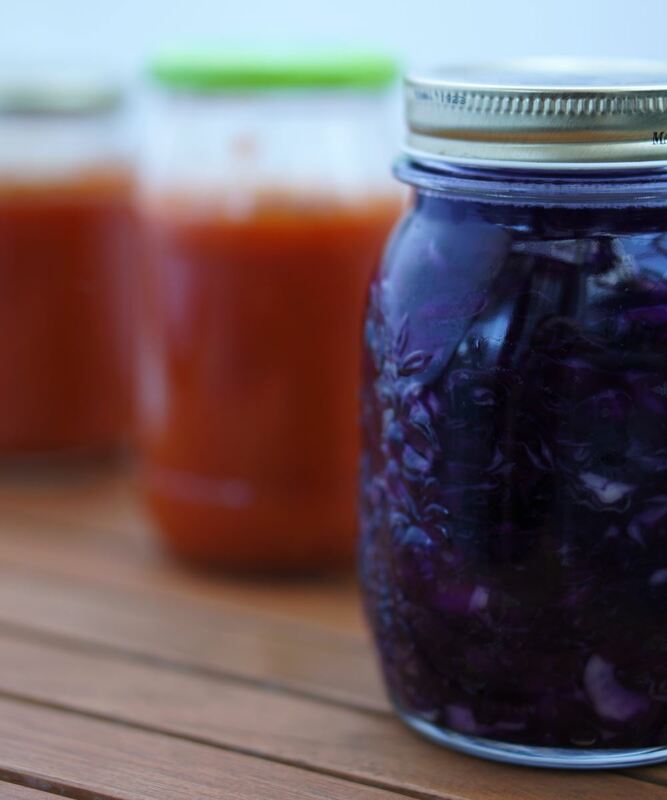 Sauerkraut – I had this red cabbage and I’ve been wanting to try out this recipe, today was the day! I followed Mama Eats Plants‘s instructions. Yesterday I bought two small candle holders at Fleamarket Porto that make perfect fermentation weights, I already used one of them for this! Melted rapadura – the rapadura (also called panela sugar) that I bought so much time ago? It was one of the ingredients that I wanted to use up in the pantry challenge but I didn’t have the chance (or rather the will)! I melted it today and it went to the fridge and tomorrow I’ll make cookies out of it since I’m too worn out today. With this, we already have two lunches to bring to work, snacks for the whole week, yogurt for my breakfast and tomato sauce for a very near future. I do love to meal prep on Sunday, it’s not always possible but it allows be to eat healthier during the week and also provides me freedom to not cook in a week night if we don’t want to. Since I like to bring my lunch to work, if I don’t have anything for the next day I feel obligated to cook the day before. Obviously sometimes we go out but I prefer to eat homecooked food. Not only that, having lunch for work the next day also makes it easier when I eat out the night before. Do you prep your meals for the work week?